There is good news for our customers! We recently changed our online shop to accept multiple currencies. We run our business in Australia but most of our orders come from overseas. For the convenience of our overseas customers, the prices listed in our shop now show the customer's local currency and we have got rid of the previous foreign exchange charges. Other than Australian dollars, we can now accept US dollars, Canadian Dollars, Euros, British pounds, Japanese yen, and Chinese yuan. When you visit our online shop, the site will automatically indicate your local currency but you are also able to choose your preferred currency by clicking on the currency on the top left-hand side of the web page. The original prices of our products are set up in Australian dollars. The foreign exchange rate will be calculated once a day automatically and, when you pay, there is no exchange difference, so you simply pay the price indicated. 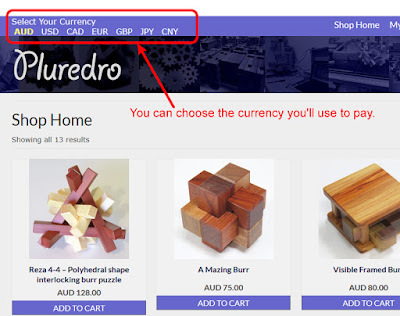 Up until now, we had only been accepting only Australian dollars, so customers had to pay the foreign exchange fee, but from now on, Pluredro shop will pay the foreign exchange charges, saving our customers about 3% from each payment. Isn't that good news? We will continue to improve Pluredro shop to create a site that is simple and easy to use for visitors. We look forward to you visiting our shop.